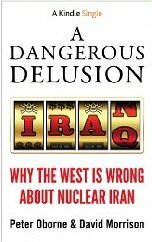 A Dangerous Delusion: why the West is wrong about a nuclear Iran, by Peter Oborne and David Morrison. In this passionate, but rationally argued essay, the authors attempt to avert a potential global catastrophe by showing that the grounds for war do not exist, that there is no evidence of an ongoing Iranian nuclear weapons programme, and that Iran would happily come to a table and strike a deal. They argue that the military threats aimed by the West against Iran contravene international law, and that Iran is not a pariah state but a legitimate power across the Middle East. For years Peter Oborne and David Morrison have, in their respective fields, examined the actions of our political classes and found them wanting. Now they have joined forces to make a powerful case against military action. Ten years on from the war in Iraq, will the politicians listen? This entry was posted in 6. BOOKS, Iran. Bookmark the permalink. Very nice argument. Too bad they are wrong. Iran is not being asked to strike a deal. They are being told to come clean with their nuclear program and open all vaults for inspection. They refused. Time for the current Iranian regime to be wiped off the pages of history. You are quite wrong. All their ‘vaults’ have cameras in them and are under 24 hour inspection by the IAEA. The main complaint that the IAEA have with Iran concerns the ‘alleged studies’ document (also known as the smoking laptop) which the IAEA received from US Intelligence in 2005 (possibly originating from Israeli intelligence), and which Iran says is a forgery. It took the IAEA until 2011 to decide that it is ‘credible’. This describes a program of work into various technologies that are relevant to nuclear weapons, but do not involve nuclear materials, and which the IAEA say constitutes a ‘possible military dimension’ to Iran’s nuclear program, and ‘may be ongoing’. In this connection they want to visit the Parchin military site for a second time. It is this that Iran is refusing. A ‘possible military dimension’ a decade ago is a very long way from being a nuclear weapons program today. There is no need for panic. And remember what happened the last time there was regime change based on ‘intelligence’ about weapons of mass destruction. Regime change should not have occurred in Iraq based on the possibility that there were WMDs. It should have occurred because of the genocide committed against the Kurds and the apartheid regime oppressing the Shi’ites. Interesting that you defend Israel from the accusation of carrying out a genocide on the Palestinians and defend it from the accusation of apartheid. And yet, when Iraq does it you consider that reason for regime change!